The luxury condominium project in Penang will boast the region's first private waterpark within a gated community. An international marina, premium water-taxi service, upscale food and retail outlets and commanding views of the Andaman Sea are among the attractions property developer E&O Property Development Bhd will offer potential buyers at its RM1.8 billion Quayside Seafront Resort Condominum development in Penang next month. The company's general manager (sales and marketing) Lim Hooi Yen yesterday said the luxury condominium project - which is part of E&O's Seri Tanjung Pinang waterfront development - will also boast the region's first private waterpark within a gated community. "Apart from marketing the project to well-travelled and well-heeled locals, we will also promote the units in markets like Singapore, Hong Kong, Medan, Jakarta, Surabaya, China, Australia, Japan and Korea," she told a media briefing at the project site in Penang. The Quayside condominiums, which comprise seven blocks of seafront units, will be sprawled on a 8.4ha site, with 1.8ha of land dedicated to a signature waterpark and clubhouse. 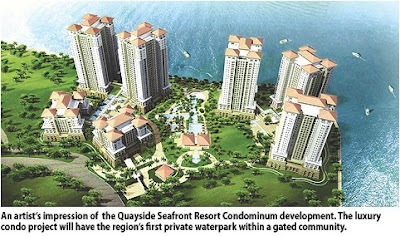 Lim said the proposed project is expected to be completed in about seven to 10 years and about 60 per cent of the total 1,200 Quayside condominium units are expected to be sold to Malaysians. On the Straits Quay retail marina, which is adjoining the Quayside Condominiums, Lim said the 4.96ha retail enclave will offer everything from boutiques to bistros, seaside cafes, bars and boat rides. "Just like in Venice, Italy, we hope to introduce the E&O limo which will be a water limousine service," she added, saying that the com-pany has already identified a watercraft that is needed for the water-taxi service. "We also plan to engage the fishermen in the area to work with us, by having local fishing boats bringing in the island's fresh catch of the day twice daily to a fishermen's pontoon which we plan to build." Straits Quay and the marina are expected to open by the end of this year, she added. HONG KONG/SINGAPORE: Orient Overseas (International) Ltd (OOIL) has sold US$2.2 billion (US$1 = RM3.34) in Chinese property to Singapore's CapitaLand as the loss-making Hong Kong company seeks to raise cash and focus on its core shipping business. The sale of residential, hotel, and retail properties in China will generate a lump sum of cash for OOIL which posted a net loss in the first half of last year, badly hit by the global economic crisis. CapitaLand, which raised US$1.8 billion from the listing of its CapitaMalls shopping malls unit in November, has been increasing its footprint in China. "This proposed acquisition is timely and an excellent strategic fit for CapitaLand," Richard Hu, chairman of CapitaLand, said in a statement yesterday. "It also fits into our stated goal of growing our assets size in China from the present 28 per cent of total assets to 45 per cent over the next five years as we remain very confident of the long-term future of the country." The US$2.2 billion deal includes the portfolio value of the seven sites of about US$2 billion and cash within the business of about US$262 million, CapitaLand said. The deal with CapitaLand, Southeast Asia's largest property developer, is expected to be completed by the end of the first quarter with the approval of OOIL shareholders, CapitaLand said. Trading in shares of OOIL, a Hong Kong-based container ship operator, and CapitaLand, were suspended yesterday pending announcements, the companies said. Last Friday, OOIL's stock ended at HK$5.15 (HK$100 = RM43.07), while CapitaLand shares closed at S$4.28 (S$1 = RM2.41). OOIL posted a net loss of US$231.9 million in the first half of last year versus a net profit of US$158.3 million in the year earlier period. The loss came as the global economy was still suffering through the financial crisis, taking a major toll on shipping companies that rely heavily on trade. OOIL, which is controlled by the family of former Hong Kong chief executive Tung Chee Hwa, made a US$5.1 million loss from its properties in the first six months of last year against a US$5.9 million gain a year earlier. The company had 1.4 million sq m of total gross floor area under development at the end of 2008 with the focus on Chinese cities, including Shanghai, Beijing and Tianjin. OOIL also holds a stake in Beijing Oriental Plaza, which comprises a retail mall, office towers, service apartments and a five-star hotel, and Wall Street Plaza, in New York City's financial district but those assets were not included in the deal. SUNWAY Holdings Bhd, through wholly-owned subsidiary SunwayMas Sdn Bhd, today entered into a share sale agreement with Templer Forest Resort Sdn Bhd for the proposed acquisition of a 60-per cent equity in Spanland Sdn Bhd for RM13.8 million cash. Sunway told Bursa Malaysia that both parties also signed a shareholders agreement to jointly undertake a property development project on parcels of leasehold land measuring 98.43 acres in Rawang, Selangor. The shareholders agreement will come into effect on the completion of the proposed acquisition. "The land is strategically located opposite the Templer Park Country Club in the affluent area north of Kuala Lumpur. "It is suitable for high-end development and is proposed for a property development project comprising low-density residential units of exclusive lifestyle bungalows which can be launched within 12 months from the completion date of the share sale agreement. "This fits into the group's strategy of focusing on niche residential projects with fast turnaround," Sunway said. Confidence in the local property scene is high with strong purchasing intention at 85.3 per cent over the next 12 months, according to top property website, iProperty.com. In its survey, the website said that 29.5 per cent of Malaysians were still looking for their first purchase and 36 per cent had owned at least two properties. "Despite the 2009 economic downturn, Malaysians believe 2010 will be a good year to start investing again. Our survey shows that we will see a steady increase in property purchases," its executive chairman, Patrick Grove said in a statement in Kuala Lumpur, today. As for preference, iProperty.com said landed properties, especially those completed remained the first choice at 53.5 per cent, followed by ready-made condominiums at 44 per cent. It said 83.3 per cent agreed that location remained the most important criteria, followed closely by price at 73.7 per cent, while 48.6 per cent were aiming for potential capital appreciation with 35.5 per cent regarding the trust in developers and brands as a top concern too. With the confidence that the property market would bottom out soon, iProperty.com said that 35.2 per cent of Malaysians with an annual household income of over RM300,000, would snap up properties. It added that 83.7 per cent of them would go especially for properties at between RM300,000 and RM500,000 and for which prices were falling. KUCHING: Naim Holdings Bhd is bidding for a RM150mil project to relocate villagers from several Bidayuh villages affected by the Bengoh dam now under construction in Padawan near here. Corporate affairs head Ricky Kho said the resettlement project in Sematang, Padawan, was expected to be implemented in two phases, which would involve 1,300 villagers from four settlements. “We (Naim) are now constructing the Sematang-Skio Road that will link up to the proposed resettlement site,’’ he told StarBiz recently. The RM70mil road project is funded by the Sarawak government. Kho said the Bengoh dam project, which is to supply raw water to meet Kuching’s requirements up to 2030, was expected to be completed early next year. He added that Naim was eyeing another road project – from Balingian in Mukah Division to Bintulu – estimated to be worth RM120mil, which would be located within the Sarawak Corridor of Renewable Energy (Score). Naim is in the midst of constructing the RM188mil Jalan Selanggau-Matadeng road project, also within Score, which is due for completion in the first half of 2011. The company has embarked on the RM140mil Kuching flood mitigation scheme (phase one). According to Kho, Naim’s wholly-owned subsidiary, Naim Cendera Engineering Construction (Fiji) Ltd, has secured a road maintenance job worth RM38mil on Fiji’s main Viti Levu island. Naim’s first contract in Fiji is now underway and it involves the upgrading of the 9.2km Kings Road, a RM65mil project funded by Asian Development Bank. JOHOR BARU: Malaysia Building Society Bhd (MBSB) wants a deeper market penetration in the east cost states where demand for financial products is still largely untapped. Chief executive officer Ahmad Zaini Othman said the company would focus on two main segments – personal financing and disbursement of loans to owners of Malay reserve land. He said unlike in the west coast states, property development activities in Pahang, Kelantan and Terengganu were moving at a rather slower pace. “These two segments in the three east coast states offer good growth prospects for us, especially for Islamic financing products,’’ Ahmad Zaini said recently. From left: MBSB regional business representantive (southern region) Abdul Halim Zainal, Tan Sri Abdul Halim Ali and Ahmad Zaini Othman at the opening of the sales and service centre. He was speaking at the opening of the MBSB Tebrau sales and service centre at Taman Mount Austin near here by company chairman Tan Sri Abdul Halim Ali. The centre was relocated from Pasir Gudang where MBSB’s Masai outlet was opened in 2000. MBSB presently has 32 sales and service centres nationwide. Ahmad Zaini said most of the Malay reserve land remained undeveloped as financial institutions were not keen to provide loans to the land owners due to the status of their land. “We are willing to offer financial assistance to the land owners or we could look at jointly developing the land with them,’’ he added. Ahmad Zaini said MBSB owned several pieces of land in the country with an estimated current market value of RM300mil and had no immediate plan to dispose of or develop them. He said the company also planned to open a regional business representative office in the East Coast Economic Region (ECER) to better serve its customers and attract new ones. It presently has four sales and service centres in the ECER – in Kuantan, Kemaman, Kuala Terengganu and Kota Baru. Ahmad Zaini said the company would be targeting more civil servants as its potential customers and planned to introduce more products tailored to their financial capabilities. “There are over 1.5 million civil servants in the country and the figure offers good growth potential for our personal finance business,’’ he said. The personal finance division currently contributes about 30% of MBSB’s total business while the balance 70% comes from home mortgages. The opening of the Resorts World Sentosa, Singapore's first integrated resort, will not affect tourist arrivals in Malaysia. "We will grow and will not be cannibalised because the pie will grow. More visitors will come especially if the economy recovers. "So, the important thing is to make it a more complete experience," Genting Group Chairman Tan Sri Lim Kok Thay told reporters after the launch of the group's 45th anniversary logo in Kuala Lumpur today. Genting Singapore PLC, a subsidiary of Genting Bhd, will open four hotels tomorrow under the first phase of the US$4.4 billion casino-resort in Singapore. The Festive Hotel, Hard Rock Hotel Singapore, Hotel Michael and Crockford Tower will offer a total of 1,350 rooms and 10 restaurants. They are expected to enjoy an occupancy rate of above 80 per cent. Meanwhile, Singapore's first legal casino and Universal Studios theme park will open to the public as soon as the group obtains licences from the Singapore government. "It(the resorts) is ready to open and we are now waiting for the licences (casino and theme park) to be issued. As soon as it issued, we will open," Lim said. The Singapore casino is viewed as the group's key earnings drivers in the future. "By end of next week, Universal Studios Singapore will open and when we officially launch Resorts World Sentosa later this year, it will be another significant and historical milestone achievement for the group," Lim said. Under the second phase of the Resorts World Sentosa, Lim said another two projects, the Equarius Hotel and Spa Villas, would be completed by mid-2011. He said Genting's involvement in a mixed development within Iskandar Malaysia comprised theme parks, hotels and premium outlets which would serve as a gateway for local visitors to Singapore and vice-versa. The group teamed up with New York-listed Simon Property Group to venture into upscale outlet shopping in Iskandar Malaysia under the Chelsea Premium Outlet Centres concept. Genting Plantations Bhd's unit, Azzon Ltd, signed a joint venture agreement last year with Simon''s Chelsea Malaysia LLC to establish the centres. Under the partnership, Genting Plantations and Simon will form a 50:50 joint-venture called Genting Chelsea Sdn Bhd to invest and operate Premium Outlet Centres in Malaysia. The Johor Premium Outlets, will be the first project to be built in Kulai, Johor, and is set to become the iconic flagship outlet centre in the Southeast Asian retail market. Expected to open in 2011, the centre aims to synergise with Genting's existing property operations and the group's leisure and hospitality footprint in the region. On Genting's Resorts World, the crown jewel within the group, Lim said the group expected its customer base to increase to 20 million visitors this year from last year's 19.5 million. Resorts World Genting, a premier integrated family leisure and entertainment resort at the peak of Genting Highlands, will offer various events throughout the year in conjunction with the group's 45th anniversary. The events were the group's way rewarding customers with rewards and giveaways which would include special discounts on hotel rooms, food and beverages, lucky draws, theme park packages, international shows and grand sales at retails outlets. AMFIRST Real Estate Investment Trust said the Selangor state government wants to compulsorily buy a piece of land in front of the The Summit Subang USJ for the light rail transit extension project. The land, measuring 4,121 sq m, comprises 159 accessory parcels in the form of car park bays attached to two plots of land that are owned by AmFIRST REIT.